The National Party could be the first to rule without a coalition since 1996. New Zealand’s Prime Minister John Key appears set to win a third term in office, as the campaign for next month’s vote gets underway. Key, who leads the conservative National Party, has played down polling that has consistently shown his party will be elected with a comfortable lead. Polls have shown the National Party with around 50 percent of the vote, while their nearest rival, the opposition Labour party, is polling between 25 and 30 percent. New Zealand has a multi-party proportional (MPP) voting system, similar to Germany’s, that often emphasizes the role of minor parties. If the National Party manages to gain more than 50 percent of the seats it would be the first government to form in its own right without a coalition since the MPP system was introduced in 1996. 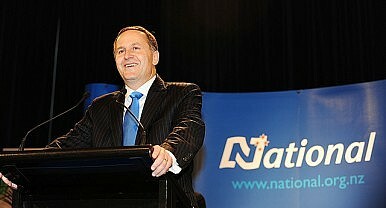 John Key, a former banker, came to office in 2008 and still enjoys a high level of personal popularity as leader. However, while he appears set to comfortably return to office, the campaign has not been without its controversies. Investigative journalist Nicky Hager published a book recently called Dirty Politics, which alleged that a former staff member from John Key’s office engaged in a political smear campaign before the 2008 election that involved giving information to right-wing bloggers and accessing a Labour Party database. “At the end of the day we’re five weeks out from an election. People can see that Nicky Hager’s made a whole lot of things up in his book,” Key said. Among the myriad of minor parties contesting the vote, a recently formed party called the Expatriate Party is running on policies advocating for more rights for New Zealanders living in Australia. More than one million New Zealanders live overseas, with the majority of those living in Australia. New Zealand has a population of around 4.4 million. The party aims to push for greater access to Australian healthcare and social services for resident New Zealanders. New Zealand is still climbing its way back from a two-year recession that ended in 2009. The country’s economy grew by 3.5 percent year on year in the third quarter of 2013, outperforming many developed nations including its neighbor Australia. Most of the growth has been fuelled by an expanding dairy market in Asia as well as large reconstruction projects in areas devastated by the 2010 and 2011 earthquakes. Tougher Times Ahead For New Zealand’s Next GovernmentA Bark But No Bite: Examining New Zealand’s Last General ElectionSay It Ain't So: New Zealand Prime Minister Calls It QuitsImmigration, Housing Key Issues as New Zealand Enters Election YearNew Zealand's Next Government: What's at Stake?